As indicated by recent news from the United States on an aggressive 54.5 mile per gallon fleet mandate for all car companies by 2025, the global push to lower fossil fuel consumption is very active. Opening the realm of what was once only dreams to automotive engineers, creations crafted to contend in the compliance to future efficiency targets are receiving the investments they so gravely needed to land on driveways and parking lots. Considering not just one innovation, the future vehicles being guided to production could be the very radical shape you’ll soon accept in everyday life. BMW (an auto company already earning creditability for advanced vehicle engineering) announced earlier this year the intent to create a sub-brand to unleash what would become a bolder form of automotive expression. Describing the BMW i as “Naturally vibrant, highly aesthetic images with a futuristic atmosphere will characterise communications”; the German automaker’s awaited division is the latest stepping-stone from their Megacity initiative. 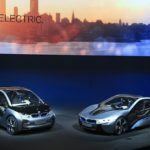 Led by only word that the BMW i brand will set on producing highly electrified powertrain configurations, seekers of greater amounts of hard information on the type of automobiles expected from the organization has now been satisfied by this past Friday’s premiere in Munich. 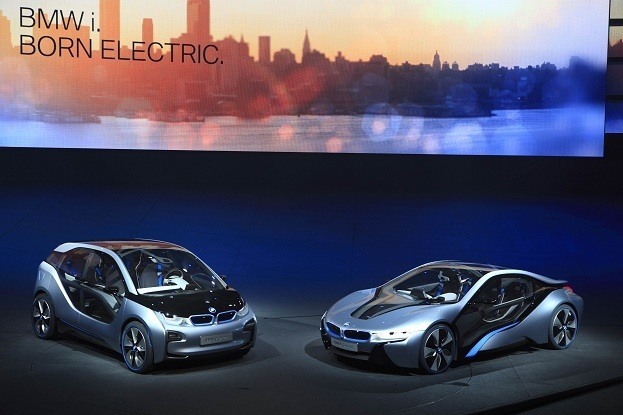 Given form through a grand introduction, the BMW i brand was showcased by physical forms of the i3 and i8 vehicles. Encompassed in their LifeDrive vehicle architecture, both vehicles represent structures especially conceived around electric propulsion. Aerodynamic maximization and usage of aluminum as well as carbon fiber materials are aspects used in exterior design of the BMW i automotive products. Employing lightweight construction, the BMW i vehicles will enter life produced using eco-minded processes. Aluminum will be manufactured using 100 percent renewable energy. In the cabin, customers will notice unique design details such as the absence of center tunnelling, increased window area and an 8.8 inch information display. Besides the many changes, much of the beloved BMW design traits have been lent to the i3 and i8 concept vehicles including the kidney-shaped grille openings. First to the market for 2013, the subcompact BMW i3 design is a four-seat vehicle weighing around 1,250 kilograms (2755.79 pounds). 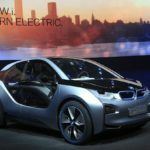 In the prelude to the BMW i product launch, the BMW company has been gaining real-life input on the expected usage of electrified vehicles. Turning a multitude of MINI Coopers into MINI E cars, these small cars were turned into rolling labs for BMW to collect information for making their BMW i line-up desirable with little compromise from customers. Evaluating the MINI E’s data, BMW reported that 90 percent of drivers were able to commute within the battery pack range of the electric vehicle. 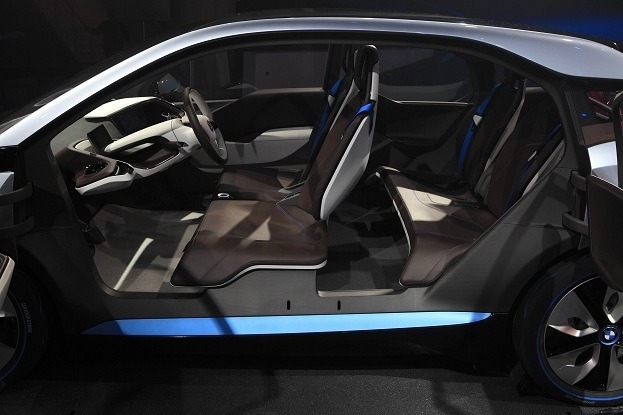 For this reason, the BMW i3 will be primarily sold as a fully electric vehicle. However, the i3 will also come with an optional plug-in hybrid configuration that will feature a range extender powerplant. As an all-electric vehicle, the BMW i3 lithium-ion battery contains the capacity for 100 miles of driving at a top speed of 93 miles per hour. 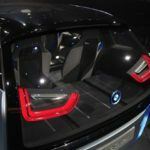 Charging in 6 hours on standard circuit, an optional quick-charge method is also available that can load the i3 battery with 80 percent capacity in only a single hour. 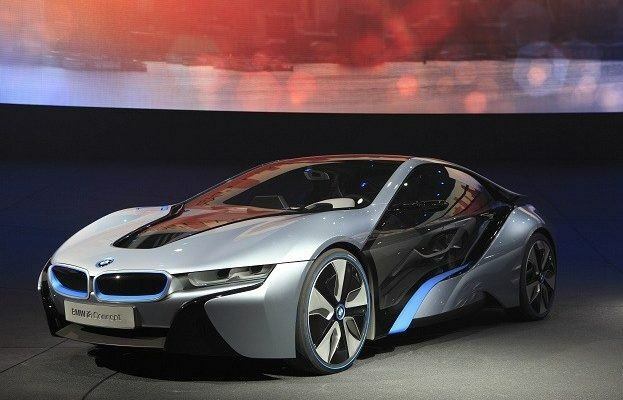 Planned to be added to the i3, the BMW i8 will follow to market in 2014. A plug-in hybrid sport coupe, the i8 is propelled by 96 kilowatts of electric power through the rear wheels and a 220 horsepower, three-cylinder gasoline engine. Provides being capable of fuel economy near 100 miles per gallon, the BMW i8 is slated to deliver acceleration to 62 miles per hour in less than 5 seconds. Going 20 miles on pure electric power, the i8 shifts to the gas engine. When both powerplants work together, the BMW i8 moves with all-wheel drive to top speeds up to 155 miles per hour. 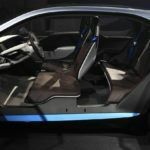 With the initial two cars presented to the public, the BMW i sub-brand also touts advanced solutions that can greatly improve driving experiences inside of urban areas. In-car technology such as Parking Assistant, Traffic Jam Assistant and Proactive Front Protection insures the highest chance of a safe return from city driving. BMW i is also vocal about partnerships created through their i Ventures. i Ventures have invested into services such as MyCityWay and ParkatmyHouse that allows individuals to rent out their property as parking space. 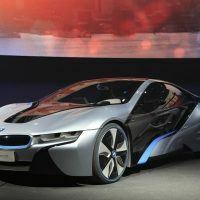 1 Comment on "BMW i Details Brand Philosophy"
It’s a long time until will see this cars on the roads. 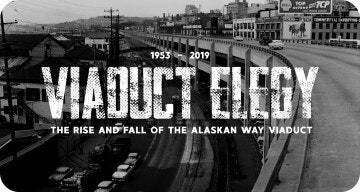 The technology for electric cars should have been more advanced by now but the oil companies had played their cards very well. When electric cars will increase their autonomy to at least 300 Km and charging time to 1-2 hours, they will be good to buy. The “green trend” is here but we need more then concept cars, we need good and reliable cars .